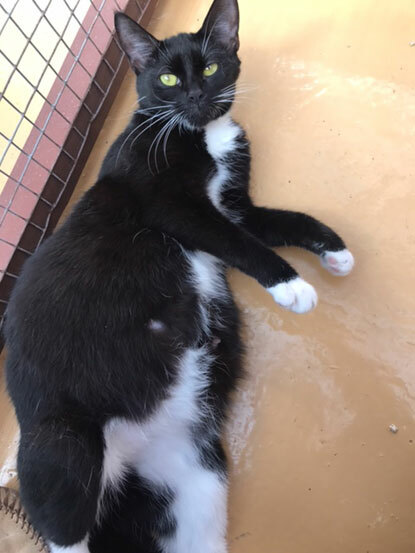 Six-month-old Bella was brought into us pregnant. We had taken her to the vets to have her examined firstly to confirm by a vet that she was pregnant and also to make sure everything was OK. The vets estimated that she was pregnant with three kittens. On the morning of 19 April we went out to her pen to check, feed and clean her and we found her with two gorgeous little kittens – one tabby and white, one black and white – suckling on her. Sadly laid by her were three cold, apparently not breathing kittens. Suddenly two of the still kittens started to move so we got a vet straight away! The vets could not have been more wonderful. They gave the kittens a shot of glucose and got them straight onto a heat pad and rubbed their teeny chests. 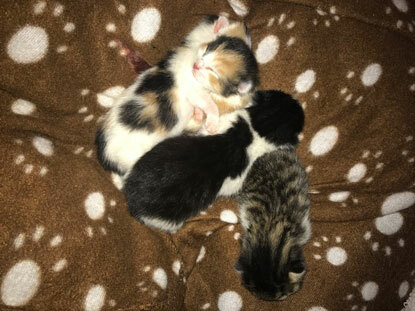 They asked us to bring Bella and her two first kittens in to see if she would accept the two latest kittens (two torties – our first ever tortie kittens!) as they would have a much better chance of survival being with their mother. Sadly the final fifth kitten could not be saved. Bella was an angel, she is now feeding all the kittens who are growing very well and they are certainly keeping her on her toes. They get out of their ‘bed’ daily and wait for her to collect them. Although at six months old she is far too young to have had kittens, she is coping as best she can. She does not yet have a home... but I know she will find one very quickly. She is a very affectionate, loving cat who just needs a kind and caring family. Bella will be ready for a home in early July and will be spayed, microchipped, fully vaccinated and flea/wormed. Veterinary note: Cats are often neutered too late in life when they have already produced at least one litter of kittens. 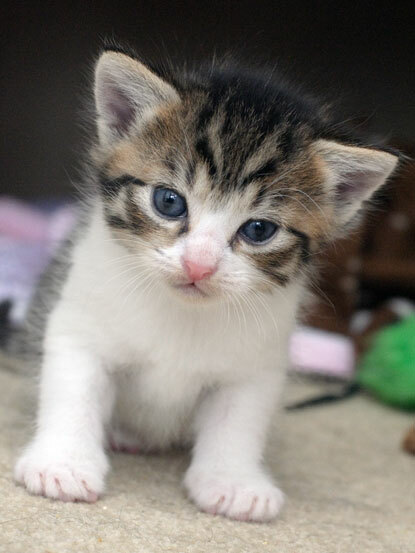 The kittens can unfortunately contribute to the number of unwanted cats in the UK, which is why Cats Protection recommends that pet cats are neutered at four months of age or younger. Find out more by reading our neutering FAQs. Bless the little one who didn't make it, Still, Bella's first (and only!) 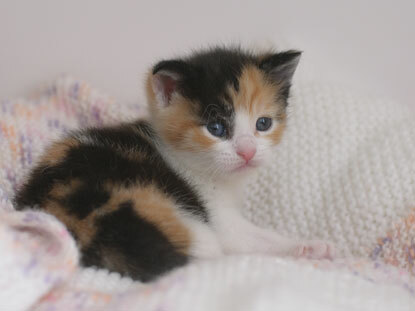 kittens are gorgeous!